I read enough horror that I reach a point where I go down a checklist to see what a book will execute well and where it will fail. It's both a joy and a frustration of the genre. I like seeing how each new book goes a different way with the usual beats but I'd love more horror that subverts expectations. THE NIGHTMARCHERS gets high marks for atmosphere and setting, this isn't a book that adds scares to the everyday, this is worldbuilding. We're transported with Julia to an exotic and menacing is I read enough horror that I reach a point where I go down a checklist to see what a book will execute well and where it will fail. It's both a joy and a frustration of the genre. I like seeing how each new book goes a different way with the usual beats but I'd love more horror that subverts expectations. THE NIGHTMARCHERS gets high marks for atmosphere and setting, this isn't a book that adds scares to the everyday, this is worldbuilding. We're transported with Julia to an exotic and menacing island, isolated from the world, inhabited only by a mysterious and secretive cult. There will be physical terrors, there will be demanding slogs through jungle, and there will be some serious creepy crawlies of every kind you can imagine and then some. It also gets points for giving us a nontraditional setup and a feeling of real stakes. Julia has a job to do, and if she does it she has the potential to make her life substantially better. This isn't one of those books where horrors will take a person's whole life away, it's one of those where enduring horrors gets you where you want to go. It's a simple shift but it's meaningful. Where this book didn't quite work for me was one of my standard horror disappointments. I tend to prefer horror on the simple side, I don't mind the mysterious and unexplained and I'm happy for it all to remain vague and unsettling. But if you're going to start explaining the mysterious, that explanation can sometimes get so complex that I start to tune it out and this is one of those times. It's a pretty elaborate explanation at the end, and while some of the twists and turns where you have to reorient yourself are rewarding, there's just a bit too much of a kitchen sink feeling near the end of the book and I wished for a less complicated story where we really got to bathe in what the story does best. My other quibble was with Julia's initial circumstances. While I like the general setup and stakes, her backstory didn't resonate for me. I like the idea that Julia is haunted by her ex-husband and everything she's lost but I never bought it. How was she with this horrible guy for so long, how has she allowed herself to be so entirely outplayed, how has her spiral been this spiral-y? She's determined, capable, and smart. I get that in the story Fenn wants to tell Julia needs to be at rock bottom, but I needed a bit more convincing of how she got there and I didn't love the device of having her ex in her head the whole time. I am a picky horror reader, so I suspect many horror lovers will rank this one higher than I do. I'm notoriously hard to please, as much as I love the genre. But I'd recommend this one to almost any horror reader. I’m not sure it’s a common lesson in the fiction I read or just fiction in genre, but I’ve noticed an awful lot of books that warn readers not to mess with things they discovered because there are always consequences. There’s Dr. Faustus, of course, and Jurassic Park. Actually, a lot of Michael Crichton fits here. There’s Mira Grant’s Newsflesh series. And now there’s J. Lincoln Fenn’s The Nightmarchers. In this incarnation of the “don’t play with that thing you found” genre-let, a botanist in t I’m not sure it’s a common lesson in the fiction I read or just fiction in genre, but I’ve noticed an awful lot of books that warn readers not to mess with things they discovered because there are always consequences. There’s Dr. Faustus, of course, and Jurassic Park. Actually, a lot of Michael Crichton fits here. There’s Mira Grant’s Newsflesh series. And now there’s J. Lincoln Fenn’s The Nightmarchers. In this incarnation of the “don’t play with that thing you found” genre-let, a botanist in the 1930s discovered something on a Pacific island somewhere near Hawai’i that has remarkable properties. Decades later, her great-niece Julia returns to the island to figure out what happened in return for a payout that will help her reclaim her daughter from her ex-husband... Read the rest of my review at A Bookish Type. I received a free copy of this book from the publishers via NetGalley, for review consideration. 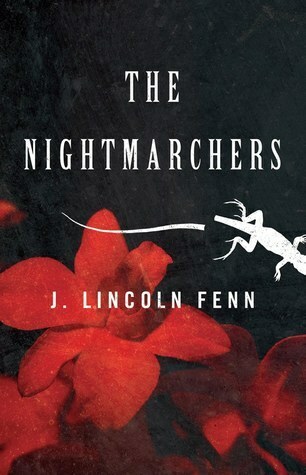 The Nightmarchers by J. Lincoln Fenn was a totally nerve-wracking tale. While reading, you won't be able to guess what happens next. At the start of the book, we see a series of letters from Irene Greer, a botanical researcher that had traveled to a remote island in the Pacific. Things start out fine, but a bit tense. But soon we see Irene begin to act strange. Next we learn that Irene has fallen down a waterfall to her death. In her letters she had been convinced that the spirits of her dead hus The Nightmarchers by J. Lincoln Fenn was a totally nerve-wracking tale. While reading, you won't be able to guess what happens next. At the start of the book, we see a series of letters from Irene Greer, a botanical researcher that had traveled to a remote island in the Pacific. Things start out fine, but a bit tense. But soon we see Irene begin to act strange. Next we learn that Irene has fallen down a waterfall to her death. In her letters she had been convinced that the spirits of her dead husband and daughter had joined the night marchers, which were the ghosts of ancient warriors that rise from their burial sites on moonless nights and wander the island. Then we jump to the present and meet Irene's descendant, Julia Greer, who is recovering from a nasty divorce. Her previous life and daughter had been suddenly taken away from her, and now she is barely able to make rent and she has no electricity because she hasn't paid that bill for awhile. When her elderly great-aunt (sister of Irene) offers Julia an outrageously large sum of money to travel to the remote island and collect samples of a flower and bring back Irene's remains, Julia can't turn it down. But while traveling to the island, she learns that there was a lot that her great-aunt had kept from her, and it only gets worse as her trip continues. Soon, Julia doesn't know who to trust and she begins to lose her grip on reality.... While reading, I really felt horrible for Julia when we first met her. Not just because she was going through the divorce and losing everything that she had once had, but because watching her try to keep up the façade of the rich when she met with her great-aunt was so heartbreaking. This was her family, and she felt that she needed to play the meeting like a game. This made me wish we could have gotten to know more about Julia before she met her ex-husband... After the meeting with her great-aunt, I was so interested to see what was going to happen! While Julia was traveling, I started to feel super anxious and that feeling didn't let up until the last page. I was so intrigued by the overall mystery; I couldn't wait to start getting answers. Especially when things started to get really strange! I really enjoyed the characters, even though, just like the main character, I could never really decide who to trust. Unfortunately, that's all I can say there without totally spoiling things! There was one bit of the book that totally gave me The Girl Who Loved Tom Gordon vibes! Julia went wandering into the jungle. Though she was warned not to touch many of the plants that she may encounter, one second of frustration put her in quite a scary situation! She had already been having trouble with keeping a grip on reality, and then she kicked a plant that snapped and oozed a sap that smelled funny and made Julia very lightheaded. Things suddenly weren't looking good; she was about to black out, couldn't stand up, her eyes were swollen, and she was having trouble breathing. And to make things worse, she had fallen into a bog that was full of twig-like leeches... I read this scene twice because it was so horrifying! I loved it! I was SO into this book up until the very last few chapters. Unfortunately, it then took a turn that totally threw me... Perhaps I missed something, but it was so odd that I didn't care enough to go back and reread it... (view spoiler)[The twist was one that left me saying "What the heck just happened?! This was SO good until now... what?!" I mean, immaculate conception, suddenly just giving up and being okay with the overall "plan", a very short pregnancy and a boy that grows up rather quickly, and writing very mature letters to a young girl who literally knows nothing about your travels in the first place? Totally weird to me. And then it was just kind of left open ended... I did enjoy that in her last letter, she kept talking about the pen running out, and then how it just ended. But the text chat that was seen next left it off on a rather frustrating note. The worst part is that I think I would have liked the ending and how open-ended it was if it hadn't taken that odd twist. (hide spoiler)] My favorite passages: She doesn't notice the letter at first. Buried in the pile of mail threatening to become a paper avalanche, it takes her a good minute to pull all of it out of her mailbox, which resists her mightily, like there's something on the other side trying to pull her in. Nothing poisons quite so well as rejection. The thing that hides itself in plain sight, that's always the thing you have to watch out for. Something inside Julia tears a little. Her soul maybe. The greatest lie we ever tell our children is that we can protect them. The truth is, the world has teeth, and people are ferocious creates, and yes, half the world is trying to eat the other half. The truth is, there are witches in the woods with houses made of candy, who entice you inside with promises of cake, but have a dark purpose. The Nightmarchers starts with the diary entries from Irene Greer who is on a remote Pacific Island. She's convinced that her dead husband and daughter are haunting her by joining the Nightmarchers - ancient warriors that rise from the dead on moonless nights. She has befriended a young girl, Agnes, who seems to know more and more about the island and it's secrets. She also jumps to her death...or did she? In modern day, Julia Greer is struggling. Divorced, living below bare necessities and drinki The Nightmarchers starts with the diary entries from Irene Greer who is on a remote Pacific Island. She's convinced that her dead husband and daughter are haunting her by joining the Nightmarchers - ancient warriors that rise from the dead on moonless nights. She has befriended a young girl, Agnes, who seems to know more and more about the island and it's secrets. She also jumps to her death...or did she? In modern day, Julia Greer is struggling. Divorced, living below bare necessities and drinking just to survive, she is contacted by her great aunt and offered a large sum of money to go to the island and retrieve Irene's bones and samples of a corpse flower that is only present on the island. Julia uses this as an opportunity to rebuild her life....but the island has other plans. J. Lincoln Fenn has created a horror story on a tropical island. Inner voices, "zombies", a cult like church, a strange little girl....it's everything I love. It was nerve-wracking to read...because you didn't know who or what to believe. This is the perfect book for this time of year (Halloween). Thanks to NetGalley and the publisher for the opportunity to read and review this book. Thank you to the publishers and Netgalley for allowing me to read this book. After a devastating divorce, Julia is left flat broke and on the brink of losing everything. A call from a long lost great aunt presents her with the opportunity to get back on track, and even better, get her daughter back. Yet, this gift comes with life changing and even life threatening challenges. Overall, I enjoyed this book. Julia is an interesting character, and kept me involved in the narrative. The pace was fairl Thank you to the publishers and Netgalley for allowing me to read this book. After a devastating divorce, Julia is left flat broke and on the brink of losing everything. A call from a long lost great aunt presents her with the opportunity to get back on track, and even better, get her daughter back. Yet, this gift comes with life changing and even life threatening challenges. Overall, I enjoyed this book. Julia is an interesting character, and kept me involved in the narrative. The pace was fairly quick and engaging. I liked the mystery, and how it stayed one step ahead the entire time. However it was sometimes confusing what was going on, and at times that would draw me out of the narrative. It's one of those books I think you have to read a couple of times to really understand. A lot of promise here but just didn’t execute fully. Still kept me reading and the premise is interesting.